The hype and story lines going in to this final were mind-boggling. This season has been unbelievable so far, and this is the pinnacle of all the hard work. Both competitors looked fatigued before the games even started, the result of endless practice and the tension of performing against a friend and teammate. 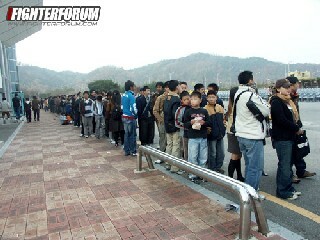 The venue for the first ever TvT final was in Taejon, which is in central Korea, 200 km south of Seoul. 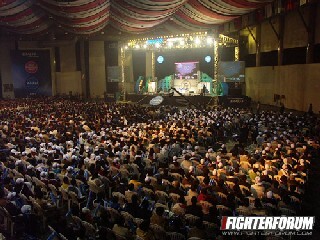 The venue itself was a large indoor auditorium with the playing booths on a rock-concert like stage. The pre-game interviews from each player can be found here. I tuned in just in time for the first game, so lets get started. Sorry did I say BiFrost? I meant to say Boxer�s backyard. The Emperor has had great success here, and it was commonly thought that for him to have a chance of winning he would have to win both BiFrost games. Lim opened with a 2 port build on the right which oov countered with two factories and an academy for scan and goliaths. Feeling secure, he expanded to his natural for his second gas, however Boxer shut it down quickly with a tank and turret on the ledge behind. By controlling the upper right portion of the map, Boxer was able to again shut down oov�s expansion at 11 with the same tank/turret combo. Despite these setbacks, oov was able to gather a force to move out into the middle map, seiging tanks, laying mines, and patrolling with a wing of wraiths. By having a good position, he was able to expand to both 6 and 12, flipping the tables on Boxer and taking the resource advantage. Both players inched closer to one another, and the game came down to a single mistake where boxer retreated back and a mine followed, destroying a handful of units. With this slight advantage, oov macroed from his superior gas and mowed over Boxer. You know, the manager for SK1 said this series would be like a sword and shield, Boxers offense vs oov�s defense, and this game showed that perfectly. Oov was so tough defensively, that despite Boxer�s early advantage from shutting down the expos, Lim was unable to dent the armour when it counted. Boxer (@7) again went for the two port build, canceling his second factory to make the switch after killing oov�s scout. His plan was short-lived however, as a vulture got into Boxers base and saw the disappearance of the second fac. Again oov countered with the goliath/scan combo as in game one, and then switched to wraiths himself after expanding to twelve and shooing away the early wraith harass. With a much slower CC, Boxer was forced to make a move on 12 and attacked with his 6 wraiths and 2 tanks. 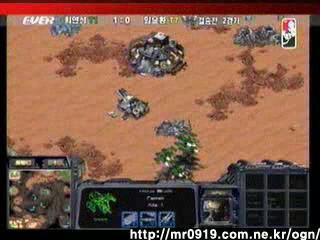 Oov brought his scv off-line and fought off the tanks while a goliath and his wraiths countered. Boxer had managed to put up a turret though, so he was able to continue his assault until more goliath reinforcements pulled up. Again Boxer attacked 12, this time with 4 tanks and his 6 wraiths, which was fortunate as he still had no expansion of his own. He halted mining at 12 however oov counted with vults by intercepting the Maynard line heading to 6, so both players were still almost even in terms of bases. Boxer started a sneak CC at 11 while slowly mining from 6. Oov floated his 12 CC down to a middle expansion, and his wraith count was becoming very scary. Fortune smiled upon him as he caught the 11 expansion with his vultures, buying him more time to increase his hidden wraith count. Finally, with at least 15 wraiths, oov moved out just as his vultures yet again found another Boxer CC at 5. The wraiths hit eleven, killing the lone turret and then the defending tanks. He followed this up with ground troops that finished the job. With both players almost done their main bases, resources were becoming a major issue. Boxer had mixed in four valks with his wraith force, and they escorted a dropship to oov�s middle expansion. Oov managed to pick off the tank, but with the valk support the wraiths had to depart and the scv were at the mercy of Boxer�s wraiths. Oov tried to swoop back in and pick off two goliaths, but he over-commit and Boxer was on him in a second. Valk rockets flew and scans lit up the screen as Boxer decimated the air force of oov. Just when I thought oov was done, tanks and goliaths came streaming out of his base in a huge line. As if the had magically appeared, oov re-took 12 o�clock, headed south and seiged at the ramp of six. Boxer had two dropships that were heading north which quickly double-backed and dropped their payload on top of oov�s force. Guns blazing, Boxer killed the entire force before scooping up his ships again. He redropped oov�s middle expansion and vult raided 12 at the same time. Oov managed to save twelve with a dropship, but he was spread too thin and his middle expansion was emptied. 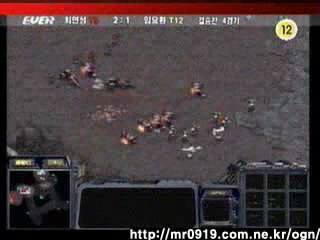 Again Boxer dropped and oov suffered more casualties to his peon group before defending. In a war of attrition, Boxer was slowly whittling down oov�s capacity to defend. Boxer was rolling now, with five dropships flying around the map escorted by his valks. Oov simply macroed an army from what resources he already had, desperate to make one more monster strike against Boxer and get the foot off his throat. Another tank/goliath army came south, perhaps ten of each. Boxer flew overhead with his ships, but two were shot down by the goliaths and all of a sudden Boxer was in trouble as vultures raided six o�clock. With Boxer�s economy in shambles from the vultre raid, oov retreated his army to eleven to defend a new CC, but his tanks got ahead of his goliaths as Boxer lured the goliaths away with his valks and empty dropships. This cost oov dearly as a mine field Boxer had placed at eleven triggered an explosion of tanks. With his army at eleven, Boxer seiged his tanks at his nine o�clock expo, cutting off any escape by oov�s army. 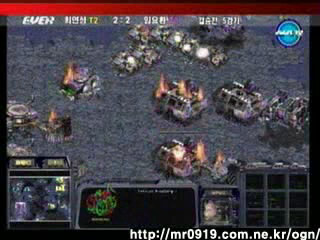 Boxer then used four dropships do hit twelve one last time, leaving oov with only eleven and no scv. GG. Boxer was o� so smart in this game, ruining oov early with the valks and being relentlessly aggressive. Boxer started up at eleven, while oov started opposite him at five. 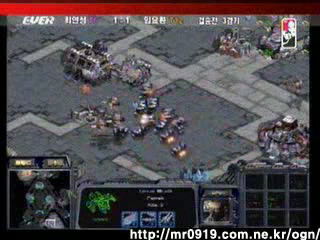 Boxer went two port for the third game in a row, while oov settled for one factory and one port for tanks and wraiths. With the advantage of early cloak, Boxer was able to pick off all of three of oov�s early wraiths and shut pick off building scv. The game looked to be over as oov had little anti-air, but he then showed why he is in the finals. Eight scv came off the minerals and promptly surrounded the goliath that emerged from his factory. The wraiths, now out of energy, fired at the goliath bringing it into the red, but the repairing scv held on tight and Boxer could not finish it. Up at Boxers base, three of oov�s tanks stormed Boxer�s bridge and entered the main. There was little to defend with as Boxer now had six wraiths and had re-attacked oov�s main. In a race of destruction, Boxer killed one goliath, but again oov mass repaired his last defender. 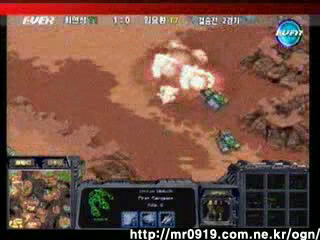 At the same time, Boxer was fighting with his scv and killed all three tanks with minimal losses. He then took his gas natural, and as his wraiths flew around the map he narrowly missed seeing a hidden CC that was already mining. Again his cloaked wraiths got busy picking off scv which allowed him to bring down some tanks and set up outside oov�s base. With a showdown brimming at oov�s bridge, both players traded shots across the span. Oov routed around the containment with 4 gols and 2 tanks in dropships, and then rolled north to take out Boxers gas expansion just as Boxer found the hidden expansion at two. As oov rolled forward, another two ships of units flew in and ended mining operations for Boxer. As Boxer tried to counter at two, oov was forced to retreat, but he had a long way to go and boxer killed most of the scv located there. With his gas natural in ruins, Boxer took eleven and his mineral only to compensate, as oov reloaded 2 with scv from his main and took five. With almost no pauses in the action, Boxer dropped 2 from the top with tanks and goliaths while oov did the exact same thing in Lim�s main with double the tanks. With the remainder of his wraith force, Boxer went head to head against four goliaths and emerged victorious with only two wraiths left. Showing off his macro, another oov army appeared at Boxer�s mineral only, spreading destruction everywhere. Both players pounded each others economies, not defending but racing to cause the most damage. In the end, oov simply had too many units, and his ground forces pounded Lim while his wraiths knocked dropships out of the air. A great comeback by oov. His hidden expansion at two was very lucky not to be seen by boxer initially, and it was only this that allowed him to survive the early wraith damage. With only one game to go, oov was looking strong to take away the title. Jeebus. After watching this game I was speechless. Boxer started at 12 and then went for two rax/acad build, while at the same time not letting oov (@9) se his strategy. Perhaps sensing that something was amiss, oov made two vults and two marines before a machine shop, which probably should have ended Boxer�s chances right there. Boxer�s build was very precise, having two scv on gas for stim while only six on minerals. In a do or die attack, six marines and two medics headed south where four marines, two vultures and six scv. Impossible right? Not if you are Boxer. Oov let his scv slip ahead just a little, and Boxer mowed down everything. After waiting for reinforcements to boost his marine count to ten, Boxer stormed the base, killing all four of oov�s marines before a bunker could be completed, something that would have ended the game. Back at home, Boxer was loosing his meager scv count to a single wraith, while oov was losing all of his as he tried to fight off the drugged up marines along with his two vultures. He continued to kill courageous amounts of units, but eventually all of his marines fell and two medics were left while only 5 scv remained in his base. Things were looking desperate and even Boxer�s mom was clutching her hands as Boxer�s last hope, six marines, ran into oov�s base, around the bunker, and forced him to float. Boxer had no scv left when his last ten MM hit the bunker, destroying it and the occupants inside. GG. Break out the defibulator, because I think my heart just stopped. At the end of that game Boxer looked like he had just gone twelve rounds with Ali. The tension in the stadium was UNBELIEVABLE. Even Boxer doesn�t know how he did that. It seems that he just had a little bit of extra magic in him tonight. After the last game, Boxer barely looked like he could keep going, and the players actually had a bit of an unscheduled break as the pandemonium settled down. Things were looking good for the Emperor; I mean how many times does he lose two straight on BiFrost? Oov landed at the right this time, going for his two factories while Boxer, for the fourth time in five games, went for two ports off the hop. Oov built a half-dozen vults early, but then made the switch to wraiths as well, putting up three ports (in a move that gave Nada nightmares). His vultures came in very handy though, because as Boxer moved out with some early ground units and his wraiths, they snuck under the block and hammered Boxer�s scv. Boxer ran a dozen to his new CC at the mineral only while scooping up eight more into a dropship while his wraiths came back to clean up the mess. With Boxer�s fleet elsewhere, oov came into the middle with his own fliers, but he ran into a turret and Boxer destroyed him with his returning wraiths, making the crowd go nuts at he loss of eight units. Was this the end? Championship #3? Oov was never one to give in this easy. He got his second gas at his natural, and Boxer inexplicably did not move his troops forward and instead fortified his middle position. His lack of scv was apparent, and Boxer expanded again, this time to eleven, as oov also took his second nat. Although Boxer was behind on economy, he got much more value for his units early on. 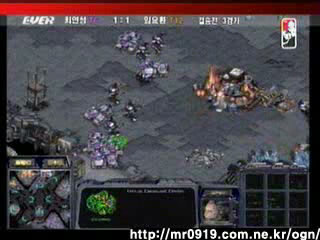 That being said, Boxer continued to get raided by vults in his main base, losing more and more scv. As oov harassed with his vultures, his strong economy kicked his macro into high gear, blackening the sky with fighters. It was under the watchful eyes of this airpower that oov tanked Boxer�s expo at eleven, while at the same time Boxer tanked oov�s gas natural. Thinking tha his opponent had commited his troops behind him, Boxer attacked head-on into oov�s other expansion with tanks and goliaths. 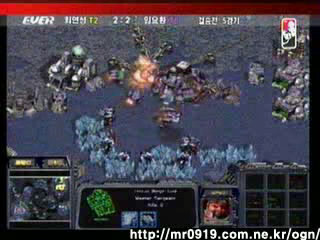 However, scv rallied infront of his tanks and oov got away unscathed. Realizing that he couldn�t go head on, Boxer took the bottom path and stopped oov�s natural again, but it cost him his entire army. With a now obvious advantage in units, oov rolled forward to Boxer�s only expansion at eleven, creating a pinch between the units from behind and the fresh ones from the front. Although Boxer managed to kill oov�s wraiths with three heroic valks, the power of oov�s tanks was too much as they relentlessly pushed forward and into Boxer�s main. And with that, Iloveoov is your EVER OSL champion. This really was one of the best 5 game series I have ever seen. The games lived up to the drama, and that is a rare event. The two players know each other so well, that the games were balenced on the razors edge. A singel mistake was all it took to win or lose. 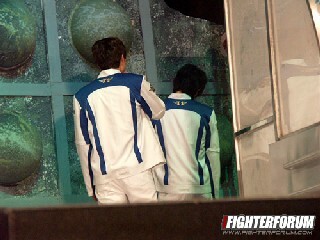 After the games, the two players were brought up on stage where Lim was unable to contain his emotions as the tears came down. Obviously I can�t know, but it looked like the stress of playing in a final against his prot�g� (and friend) Iloveoov. Although it put a damper on oov�s celebration, as well as the awards ceremony, I totally sympathize with him. The pressure both players were under was incredible, and it seemed that at the end it all came out in a rush. I thought the most touching moment was when oov went to comfort his friend at the end, giving up his own glorious time for the well-being of someone who has obviously given him so much. As for Iloveoov, he has cemented his place as one of the greatest players ever, all with less than half the OGN games Boxer has. Three straight MSL titles and OGN champ in the past year is a feat that instantly puts one in the StarCraft Hall of Fame. The post game interview with Iloveoov can be found here. Upcoming will be the TeamLiquid Awards for this season. Check an upcoming post for voting procedures. To Suport@Bethsoft.com: okay so i completed morrowind.. um, can i have my life back now? Mani you almost rocks as much as oov! I feel rather poor for Oov. Many audiences left right after Boxer typed gg + his elder brother's tears seemed to make him unable to enjoy his achievement, which he totally deserves. oy! nice report. I don't need to get the Vods. TvT vods always puts me to sleep... but I can read a good mani report on any mu any day. is that the fastest report? 4th game is really awesome. I'd doubt anyone else could make such exciting and breath taking moments in SC like that. insane games.. really expected boxer to take this title tho. boxer: well i'm taking a gas expo too then, meaning i have gas + min only expos to your 1 gas expo. OOv: here are 5 tanks to make sure you can't get your gas expo going, and not only that i'm taking another gas expo. OOv: i can block everything you throw at me now b/c i know your economy is hurting bad and i have 4 facs grinding out tanks. You forgot the Vultures from Bifrost that were so important for Oov.